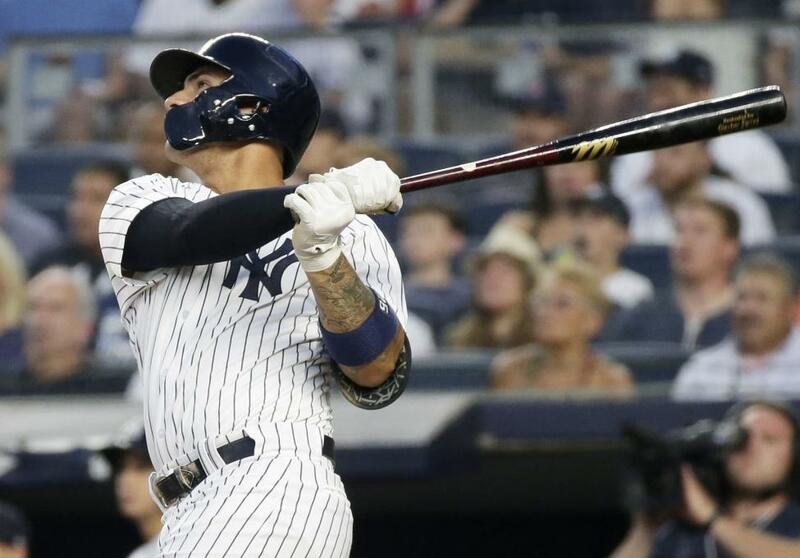 For the past two weeks, Gleyber Torres has played shortstop for the New York Yankees. Torres is filling in there and hitting well of late while Didi Gregorius recovers from a left heel contusion. On Sunday, it is possible that Torres slides back over to second base when the Yankees conclude a four-game series with the Detroit Tigers. The Yankees can move Torres back to second base after obtaining Adeiny Hechavaria on Friday from the Pittsburgh Pirates just before the deadline for players to become eligible for the postseason. Regardless of where Torres is playing, the Yankees hope he continues his recent roll. On Friday, he hit the go-ahead two-run bases-loaded single in the eighth inning of a 7-5 win and a day later hit the go-ahead two-run homer in a 2-1 victory. Torres struggled initially in his return from the disabled list with a hip injury but has turned it on of late. He slugged his 22nd homer Saturday, giving him home runs in four of his last nine games. Torres also is batting .420 with four homers and 11 RBIs in his last 14 games since Aug. 18. The hot streak has seen his batting average climb from to .259 to .282. "He's impacted our club in a profound way on both sides of the ball all year," Yankees manager Aaron Boone said. Sunday will mark two weeks since Gregorius was injured in a collision at first base with Toronto's Kendry Morales. While Gregorius is making progress, general manager Brian Cashman said he believes next weekend's series in Seattle is more realistic for his return. That's where Hechavaria comes in. Regarded as a defensive whiz with some pop, the Yankees hopes he adds to their depth much like Andrew McCutchen whenever Aaron Judge returns from a broken right wrist. "It was a big surprise for me," Hechavarria said through an interpreter. "When I got the news, it was about 12:30 at night, so I was not really waiting for anything like that. So it was a big surprise for me." McCutchen went 0-for-3 and batted out of the leadoff spot after joining the Yankees in a trade with San Francisco. He went unclaimed through waivers last week, but the Giants won five of six after splitting a four-game series with the Mets and were hesitant to move him until Friday. "I didn't have the game I wanted to have personally, the first one, but we got the win and that's what's most important," McCutchen said. "But yeah, all around it was a good day and it's a day I'm not going to forget, for sure." With more of a complete lineup and Gary Sanchez back from a second disabled list stint, the Yankees will attempt to make it 12 wins in 16 games and conclude a stretch of playing mostly losing teams before heading to Oakland for a three-game series Monday. Detroit, meanwhile, will try to get the big win that has eluded its offense since Victor Martinez and Niko Goodrum homered in the ninth inning off Dellin Betances in Thursday's 8-7 win. The Tigers went 2-for-9 with runners in scoring position Saturday and are 5-for-20 in those situations in the last two games. Victor Martinez drove in the lone run with a sacrifice fly as Detroit fell for the seventh time in eight games. "We had high-anxiety at-bats," Detroit manager Ron Gardenhire said. "You've still got to stay within yourself. Hit a ball up the middle -- or shoot a ball the other way." Although Detroit has continued to lose, it seems their last two losses are better than the five that preceded this series. The Tigers entered with a five-game losing streak where they were outscored 34-10. "I just know they have a lot of good players and they're in the race with the Red Sox," Detroit right fielder Nicholas Castellanos said. "Every single game that we've played against them, we've been in it and we've been one scenario away either or to be 3-0 against them." Lance Lynn (8-9, 4.84 ERA) will make his sixth start and seventh appearance for the Yankees. So far, he is 1-1 with a 3.98 ERA since being acquired from Minnesota on July 30. Lynn last pitched in Tuesday's 5-4 victory over the Chicago White Sox, when he allowed three runs and seven hits in 5 2/3 innings before the Yankees won it in the ninth on a homer by Neil Walker. The right-hander is 2-2 with a 3.16 ERA in four career starts against Detroit. Matthew Boyd (8-12, 4.22 ERA) will be the third left-hander to start for Detroit in this series after Francisco Liriano opened the series and Daniel Norris pitched Saturday. From June 19 to July 20, Boyd was 0-5 with an 8.36 ERA in six starts. He is 4-3 with a 3.30 ERA in five outings since. Boyd's last outing was the worst of his recent showings as he allowed five runs and seven hits in six innings of Tuesday's 6-2 loss at Kansas City. It also continued his struggles on the road where he is 2-9 with a 5.75 ERA in 14 starts. "He's had some good ones and a couple of where he ends up throwing a lot of pitches," Gardenhire said. "He's just kind of when he gets in (trouble) he starts shaking his head a lot, overthinking things, that's what gets him into trouble When he pitches off his fastball, like most pitches he does pretty good." Boyd is 0-2 with a 9.35 ERA in two career starts against the Yankees and is making his first career appearance at Yankee Stadium.